A sailboat turned over throwing 10 people in to the water off of San Diego Bay, Sunday. Two men died on the spot, a woman was sent to intensive care, and seven people were injured said the authorities. The harbor police rescued and pulled out of the water and in to a boat dock everyone aboard the sailboat. Paramedics and firefighters provided first aid but two elderly men in their 60s died on the spot. The other eight were immediately sent to a local hospital. Two children were discharged from the hospital following brief treatment. Although only 10 people were reportedly aboard the sailboat, divers made sure that there were no any other additional victims in the accident site. Maurice Luque, spokesman of the San Diego Fire and Rescue Team, said that they are confident no one else was a part of the accident. Most of the injuries were not fatal, although a woman was treated in the intensive care unit of the UCSD Medical Center due to hypothermia. None of the names of the victims were released immediately; however, Luque said that most of them are Asians. Investigators are still trying to figure out why the boat capsized and sank. Marguerite Elicone, spokesperson of the Port of San Diego, said that there were no other vessels involved and that although there were witnesses they are not sure how significant what they saw are. 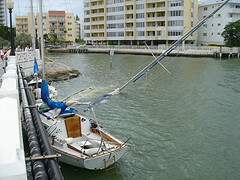 Investigations are led by the Harbor Police. The Coast Guard were also on the scene, however, many said that they did not immediately respond to phone calls regarding the accident.